This silver token is from an establishment called The Peach in Stoney Sept Westeros. 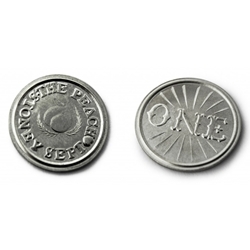 Establishments of this sort were frequented by the short-statured Tyrion Lannister, and in light of this, such brothel tokens are sometimes referred to as a “Dwarf’s Penny” by the uncultured seeking to make jest at the expense of the Lannisters. It is thought to have been struck by private arrangement at the Oldtown mint (the details of which we can only imagine as they do not appear on the mint ledgers) around the 300th year after Aegons conquest united the seven kingdoms of Westeros. Obverse features a peach with the lettering "The Peach Stoney Sept", reverse simply reads "one". In use, these tokens were purchased from the management of the establishment to gain admittance, and then tendered to the courtesan of choice, who then turned them back in to the mangement as proof of services rendered. They seldom circulated outside the establishment except in cases where a friend would purchase one as a gift. Few indeed can resist the temptation to spend THAT dwarf penny, and so for this reason they are considered rather rare outside the walls of THE PEACH.